Q: What's the towing weight? Q: Can I take this caravan off road? No, this van is designed and built to go only on sealed bitumen roads. The construction of the trailer is suited to normal highway conditions. Taking this van off road may forfeit some or all of your bond. Q: Will I need to get a brake controller for the caravan? No! An electric brake controller will be supplied for your vehicle during the handover. 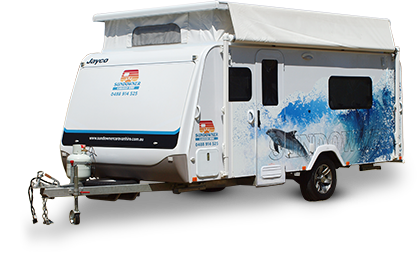 Your vehicles capacity to the Jayco Expanda relates to the towing capacity of your vehicle. Your vehicles owners manual will indicate maximum legal "braked" towing capacity and maximum tow ball weight. You should ensure your vehicle complies with the following towing specifications to ensure you are not breaching the law and/or compromising your vehicles safety and insurance. Your vehicles capacity to the Jayco Starcraft relates to the towing capacity of your vehicle. Your vehicles owners manual will indicate maximum legal "braked" towing capacity and maximum tow ball weight. You should ensure your vehicle complies with the following towing specifications to ensure you are not breaching the law and/or compromising your vehicles safety and insurance. Yes you need to be over 25 years of age and under 75 years of age for touring hire. Q: Are there any restrictions where I can take the caravan? All Sundowner Caravans may be taken Australia wide, however they must be driven at all times on a seal/bitumen roads. Past Carnarvon there are additional charges. Q: Is Insurance included in the hire rates? Yes. All Sundowner caravans have full comprhensive and public liability insurance. However, you are required to have comprehensive insurance for the towing vehicle named on the contact.Your personal items are not covered in the caravan insurance. Q: Will my electrics work with the caravans? Our caravan are fitted with 5 & 7 round pin or 7 or 12 pin flat 12V plug. Adapter plugs available if required . Some european vehicles such as, Land Rovers, VW's, BMW's and Volvos do not allow the operation of LED trailers lights effectively. In this case it would be mandatory you consult your vehicle user manual and dealership to provide an adaptor that enables legal operation of LED trailer lights. Q: Does the caravan have a battery? Q: Does the caravan have a fridge? Yes, it is fitted with a 3 way 150lt fridge/freezer (12v, gas, 240v). 130 litres can be used for refrigeration and 20 litres for freezer. Additional portable fridge/freezer also available for hire. Q: Does the caravan have power? Jayco on road caravan is fitted with a 12v lighting system and can also be connected to 240v mains power when available. Q: Do I need to supply cooking equipment? No, your hire comes with a 3x burner gas stove and 1x 240v element. Q: Does the caravan have a water tank? Yes the caravan is fitted with one 90lt underbody water tank. Q: I have never used a caravan before, what do I need to know? A practical demonstration is provided when you pick up your caravan. An instruction manual is also provided in the caravan as well as a tablet with easy to follow videos ( please allow up to an hour to complete your handover). After a full inspection of the caravan has been carried out usually 3 day after dropping the caravan back. Awning is not covered by insurance. Q: Do I have to clean the caravan before I return it? Yes. Sundowner Caravan Hire needs the caravans to be returned in the same comdition they were hired, otherwise a professional cleaning fee ($80 per hr) will be deducted from the bond. Q: If I have any problems who do I contact? You can contact Sundowner Caravan Hire on 0488 914 525. We have a 24hr message bank. The safety of yourself and your travelling companions should always be your primary concern. Emergency service agencies are the first point of contact where risk or injury to human life is at stake. We will provide you with a roadside assist number upon collection of your caravan. Q: What if I want to stay longer than I have booked? Sundowner Caravan Hire will do everything in its power to accommodate any changes or requests, however durring the peak seasons most of the caravans are fully booked and would need to be returned on time. Sundowner specialise in the latest model caravans and teardrops.